Book your tour through the amusement park in advance! 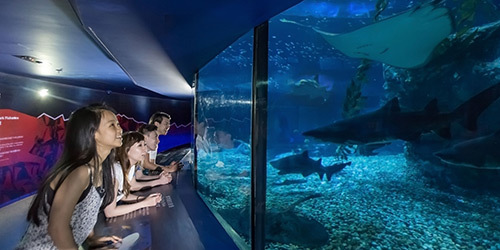 Discover a series of unique and fun-filled experiences at Ocean Park. Don’t miss the opportunity to get up close with animals such as dolphins, seals, pandas and many more animals through interactive shows and programmes. Explore the Australian outback at Adventures in Australia and get the chance to meet the adorable Koala bears, Wallabies and Kookaburras. Visitors seeking for thrills and excitement can hop on to various amusement rides suitable for all ages to enjoy. Present the voucher at Shutters at The Waterfront and register for an account online. Tourists can view and download photos taken in more than 10 photo capturing points within 14 days. (For Combo Tickets) You will receive a separate e-ticket within 2 working days which you could present at the turnstile of the attraction for entry. Take the world’s second longest outdoor escalator in the world between Marine World and Adventure Land. The clear tunnel shields your ride throughout its 225m length, offering you unhindered views of the park spread out before your eyes. To plan your Ocean Park visit, please check the daily schedules and if there are any temporary closures in advance. Visitors may apply for special programmes and tours at least 2 days in advance. These tours come at additional cost beside entrance fee. Check full list of interactive programmes and fees here. The Citybus Route 629 runs daily from Admiralty MTR Station (09:00 to 16:00, every 10min interval) or Central (Star Ferry) (09:45 to 15:45, every 20min to 60min interval). The bus fares are HK$10.6 for adults and HK$5.3 for children (aged 4-11).